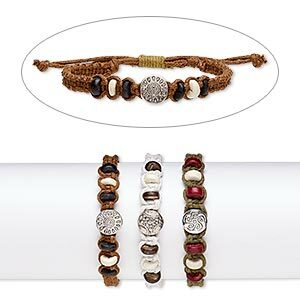 Bracelet mix, leather (natural / dyed) / resin / waxed cotton cord, black / tan / white, 25mm wide with mixed design, adjustable from 5-1/2 to 8 inches with knot closure. Sold per pkg of 5. Item Number: H20-1186JU Have a question about this item? 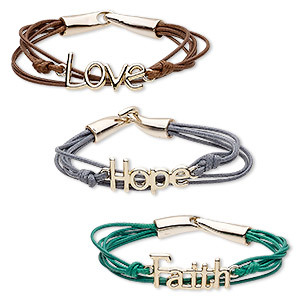 Casual and fun leather bracelets are perfect for everyday wear. 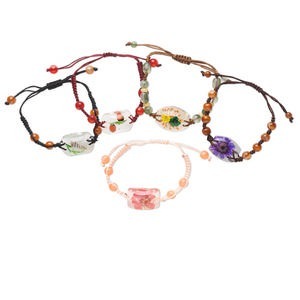 Each package contains five bracelets. 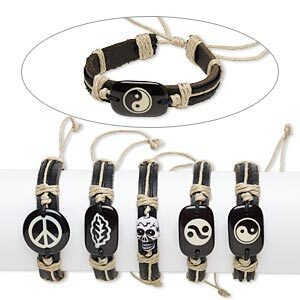 Designs can include yin-yang, leaf, peace sign, skull and more. Colors, shapes and sizes may vary in each lot. 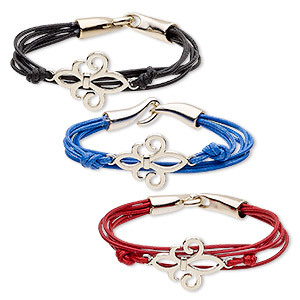 Bracelet, waxed cotton cord and rose gold-coated acrylic, blue / red / black, 24mm wide with 30x24mm fleur-de-lis, 7 inches with hook-and-eye clasp. Sold per pkg of 3. Bracelet mix, resin and cotton, multicolored, mixed size and shape with flower design, adjustable from 5-1/2 to 8-1/2 inches with macramé knot closure. Sold per pkg of 5. 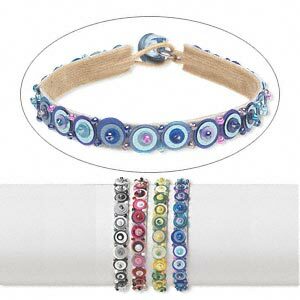 Bracelet mix, cotton and acrylic, multicolored, mixed shape with wards off the evil eye design, adjustable from 6 to 8-1/2 inches with wrapped knot closure. Sold per pkg of 3. 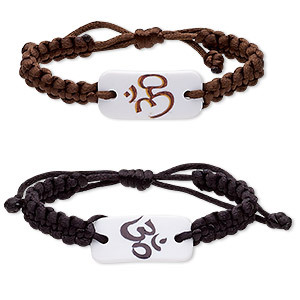 Bracelet, nylon and acrylic, black / brown / white, 17mm wide with 36x17mm curved rectangle and Om symbol, adjustable from 6-1/2 to 8 inches with macramé knot closure. Sold per pkg of 2. Bracelet mix, wood (natural) / stained wood / waxed cotton cord / silver-coated plastic, mixed colors, 10.5mm wide, adjustable from 7-9 inches with wrapped knot closure. Sold per pkg of 3. 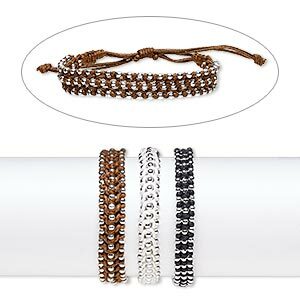 Bracelet mix, waxed cotton cord and silver-coated plastic, mixed colors, 9-13mm wide, adjustable from 6-10 inches with knot closure. Sold per pkg of 3. 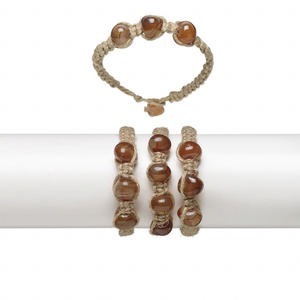 Bracelet, agate (natural) / hemp / resin, brown and orange, small pebble with woven design, 6-1/2 inches with button clasp. Sold per pkg of 3. Bracelet, nylon / waxed cotton cord / acrylic, pink / purple / light blue, 8mm wide with 7.5mm flat round, adjustable from 6 to 7-1/2 inches with macramé knot closure. Sold per pkg of 3.